Settling down now into some light run training to keep the weight down (it’s needed) while I consider what I might be doing in 2015. I’ve started to warm to the idea of short-distance running (which is both relative and provides quite a margin of choice when you come from Ultra distance). Barring injury and illness I’m quite sure I can bring down some old PBs that were all set during multi-sport/triathlon training. I have options from track sprints right up to marathon, so plenty to keep me amused. I’ll still include the odd swim to buffer the training and some gym sessions. But I’m sticking to my guns with regards to quiting endurance racing, apart from those I have been (prior) committed to. On Sat 22 August I drove from London to Bristol to take part in the Green Man Midnight Express. A 45 mile Ultra run that uses the Green Man Challenge route around Bristol. The difference between this race and the spring event is this is around 3 miles shorter, starting from a point on the loop itself rather than outside. It also goes in the opposite direction (clockwise), and starts at midnight. I’ve run through the night before, but never with fresh legs. So I was quite looking forward to what I considered could be one of my last ever Ultra races. My fitness was nowhere near as good as it has been in the previous Green Man races and because of the darkness and navigational issues I didn’t expect to get near my course record. But at the start I was keen to press on at a decent pace and use any stops from (mis)navigation as my breaks. After a few miles Brian Robb and I worked at the front together. Thankfully my Garmin 310XT was able to put us on the right track a few times when we couldn’t find our way eg through gaps in field hedges. I was suffering quite early on in the race with stiff hamstrings and this developed throughout to the point I had to pull out at aid station 3 (c.30 mile) around 4-5am in the morning. A shame I couldn’t continue to the finish but I had been reduced to a walk and I still had a further 15 miles to complete. With a hike over the Coast to Coast in just over a week I felt I made the right decision. An experience all the same, and a well organised event. On Mon 1 September I took a train(s) up to St Bees in NW England. This was to be my third trip across Wainwright’s Coast to Coast route from St Bees to Robin Hood’s Bay that crosses the Lake District, Dales National Park and North Yorkshire Moors. The first was a hike with my brother in two weeks back in 2008. The second was a sub 4-day solo ‘challenge’ last year which included overnight stops. I had originally planned a sub 3-day attempt, but due to health and lack of training I decided to turn it into a hike, with some differences. I wanted to keep the backpack weight as low as possible. The problem was that to wild camp I would need to add around 2kg for my lightweight tent and sleeping bag. Despite my usual chopping of weight and restriction of items I still had to take my larger hiking backpack and was looking at 11kg. This almost removed all chance of running. Arriving in St Bees at 4pm I proceeded at a decent walking pace with a few sporadic runs on any light downhill sections. I averaged around 4miles/hour on the move. I tried to keep to the ‘official’ route generally (about 70% of the time) but I also tried out some new routes. After the first of the lakes at Ennerdale I was surprised just quickly the light was starting to fade. 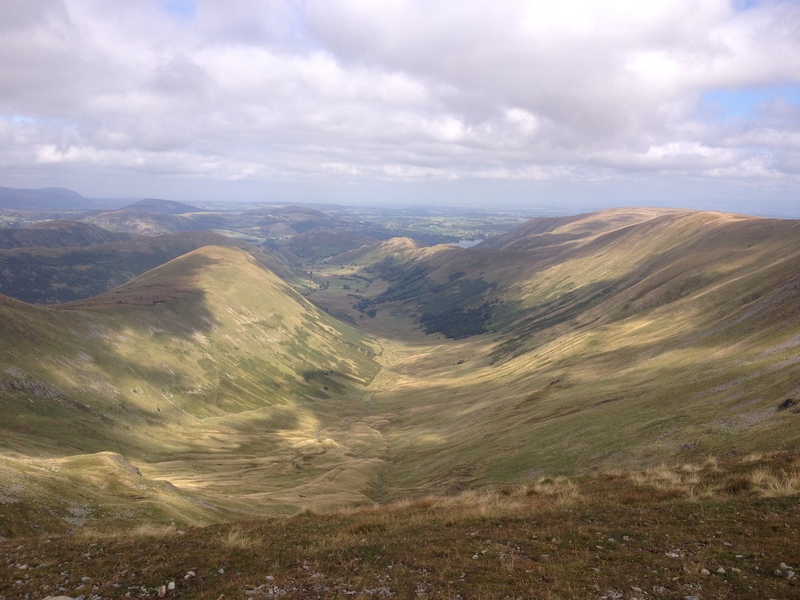 I’d barely started my first climb, up Grey Knotts (700m). I took a break to sort out my headlamp, eat the last of some chips (bought in Cleator) and I was immediately engulfed with midges. Annoying little critters. At 10:30pm I took a break at a campsite in Rosthwaite, and then continued up the next mountain past Lining Crag, and a section I’m very good at getting lost in during the day let alone at night. With my Garmin, a map/compass and piles of luck I managed to find my way through the marshes and over a couple of streams. I was back on track. It was now closing in on 3am and I was fast approaching Grasmere. Originally I planned to camp next to Grisedale Tarn, but that was still a few hours away and it would be light. All around me were marshy slopes of sheep crap. Just before town as I passed a couple of barns I saw a sign, “Poets Walk”. It was pleasant, flat and I eventually found a nice patch of lush grass. The batteries on the headlamp were almost finished so I scrambled the tent and tried to crawl in to what my Dad refers to as ‘the coffin’. No idea how I got into the sleeping bag. I spooned my backpack while I tried to get some sleep. Not sure if I slept but remember having a fever and thumping heart rate, then waking just after 5am cold and to the sound of a loud thump. I looked out of the tent to see an apple tree on one side and a bench on the other…..and stretched out in front of me was a croquet lawn. With the sun rising and a hotel in plain view I decided to make a hasty retreat! With just a few 9-bars left for breakfast and tired muscles it was slow progress for the rest of the day past Grasmere, over the mountain to Patterdale and then up over Ramsgill Head and along the north-west plateau above Haweswater. When I reached Shap I decided my body had been through enough and booked myself in at the local Hostel. Wednesday morning. I wanted to reach the Brompton on Swale Barnhouse (3 miles east of Richmond) by the evening. The only way I could do this was to use a couple of buses. It still left me with at least 40 miles of hiking over the Dales, but I managed it. 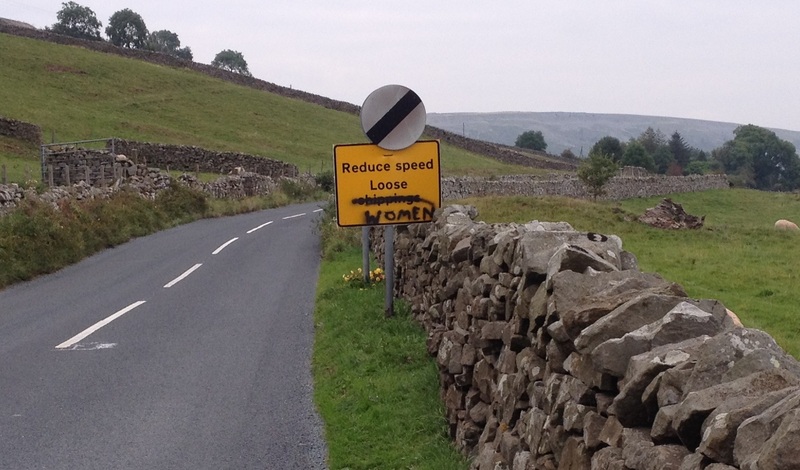 And I had a great time in the process taking the high route over the disused mines between Keld and Reeth. The final walk to Brompton was painful. I hoped to look inside the old Hospital of St Giles (marked on the map) just as it was getting dark, but it was no longer there. I had the barnhouse to myself once again – £9. Not bad. Thursday was supposed to be an easy day with plenty of time to get to Northallerton Station in the evening for my train home. I looked forward to having another wander, starting with a diversion into Scorton. I headed straight for the cake shop/café and had a good chat about the history of the village including the famous archery competition that has been running since Victoria I ! They still use long bows, with the first (of 10) to hit the bullseye winning a (fake) silver arrow, just as the original competitions were run. The following walk across a few fields and quiet country roads gave me the opportunity to practise my German, well lack of it (I’m starting to learn). I stopped at the pub in Danby Wiske for a couple of pints getting into a chat with the barman and a Canadian hiker. By the time I left the beer and fatigue had created a nice mellowness, colours seemed richer and the pain had diminished. It didn’t last long though, I felt sick an hour later and then trudged into Northallerton with swollen feet feeling completely deflated. Couldn’t wait to get back to Hampton. With 120 miles of heavy hiking and the Green Man the week before I was now ready to take a break. It usually takes me around a week to fight off the deep fatigue from multi-day efforts (‘over-reaching’), and another 1-2 weeks to get back up to speed. I would now say that hiking is best done over a much more leisurely pace with shorter daily distances. If you want to run over several days then that’s fine too. But trying to do something that falls between the two isn’t going to be as much fun. That’s in my experience anyway.